The Acme-Keystone Manufacturing Co. of Beaver Falls, Pennsylvania, was not the most successful of typewriter producers. The three machines it produced, the Keystone, the Sterling and the McCool 2 (there is no McCool 1) are all very rare today. 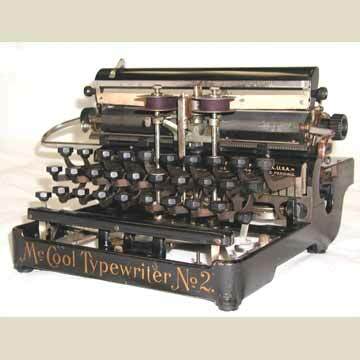 The McCool was a relatively cheap 3-bank keyboard typewriter. It used a typewheel similar to the Blickensderfer, a hammer that strikes from behind from a sliding rail like the Chicago, and an impression strip along the carriage, similar to the Hammond (photo 3). It was invented by William A. McCool who was granted a patent in 1910. Production, however, was stopped when a fire destroyed the factory. Hence, one extremely rare machine. See the book TYPEWRITER, page 184, for details.